The accumulation of savings from income will, over time lead to an increase in wealth. This report section looks at components of wealth as derived from the Federal Reserve’s 2007 Survey of Consumer Finances Chartbook. The survey is taken every 3rd year since 1989. 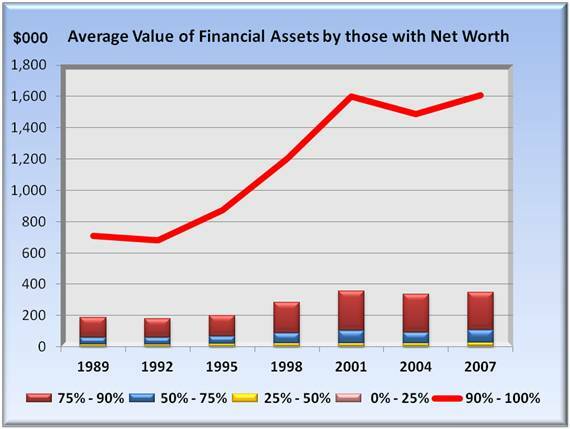 The next graph highlights the average value of assets over this period by those who have a positive net worth. Unlike the income section which divided households into quintiles (fifths), these Federal Reserve data are divided into quartiles (fourths) with the top divided again, from 75% – 90% and the top 10%. As with income, wealth is concentrated at the top of the pyramid. The results are not a surprise for 90% of the population that are shown as stacked bars in the graph below. Far above are the top 10% whose wealth dominates. Those assets are not homogeneous. They consist of several components starting with the graph below. It breaks out the financial asset portion of net worth. This category includes CD’s, bonds, mutual funds, stocks, cash value life insurance, and retirement assets. Similar to the total asset graph, the top 10% soar far above the crowd. Here, however, there is a flattening of the financial holdings in this current decade. Since total assets continued to climb, it is only logical that nonfinancial assets continued to climb, and indeed this is the case as shown in the following graph on nonfinancial assets. 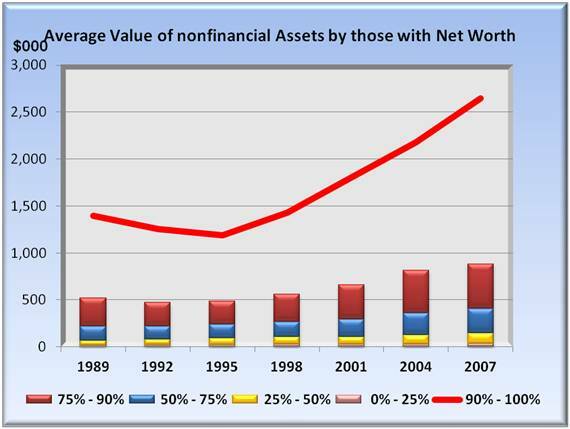 Since 1995, there has been an unrelenting and significant increase in nonfinancial assets. Business equity comprises the bulk of nonfinancial assets. 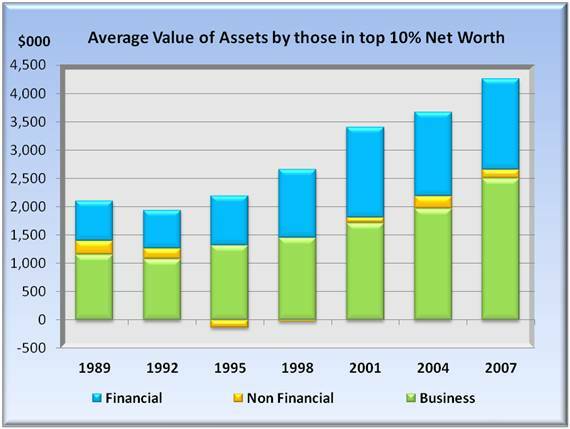 The following graph breaks down average assets by financial, business equity, and other non financial. From an average of $2 million in the early 1990’s, total assets have more than doubled to over $4 million on average. 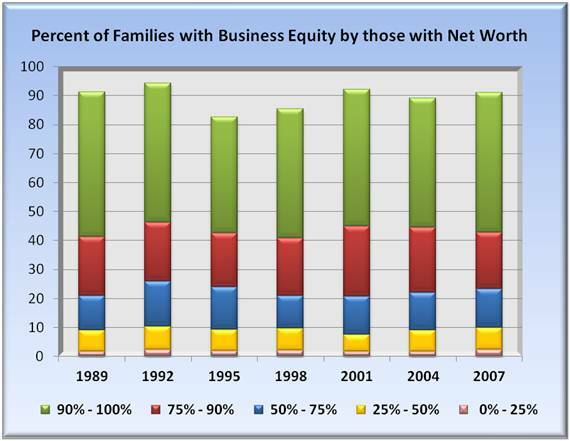 Further, the growth since 2001 has come from primarily business equity. The final component of nonfinancial assets is debt, shown in the graph below. All groups leverage a portion of their assets with debt. 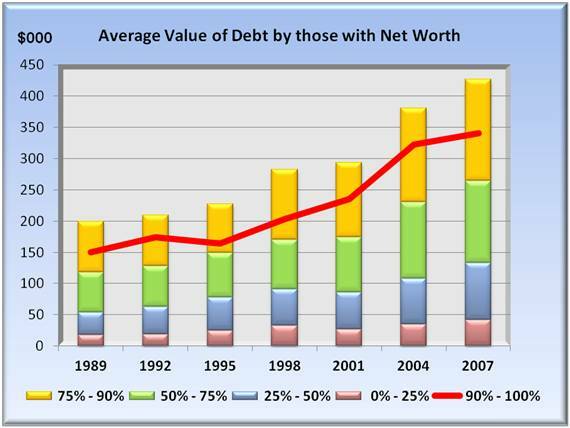 Here the leverage declines with higher net worth. Since debt does not apply to hedge funds which are financial assets, this debt is primarily associated with business equity. And it makes sense. Smaller businesses tend to carry more debt, particularly those trying to grow. As the business gets large, its growth opportunities are fewer and need for cash is likely to be less an issue.